The installation metaphorically refers to the idea of bonding two images as in marriage. Like Sergei Eisenstein’s theories of montage, the Wedding dialectically juxtaposes two video projections made of various film fragments. Each projection reveals the unseen or the invisible. One projection, a series of cloud formations, which through the process of time-lapse reveals the naturally imperceptible movement in the sky. 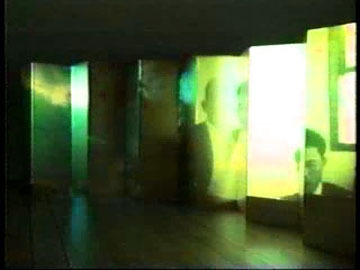 The other projection is a collection of archival films of Japanese Brazilians (Nipo Brazileiros). These films are processed in extreme slow motion to reveal the normally unseen movements of the everyday. The wedding of these two recordings creates the dialectical third meaning of the thesis-antithesis. The projections are shown on a large byoobu gold screen which signifies a wedding in Japanese culture.